Quality Rated is a systemic approach to assess, improve, and communicate the level of quality in early education and school‐age care programs. Similar to rating systems for other service related industries, Quality Rated assigns a quality rating (one star, two star, or three star) to early education and school‐age care programs that meet a set of defined program standards. 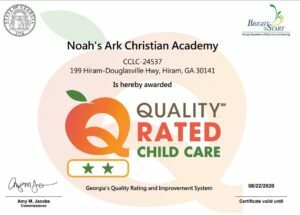 By participating in Georgia’s voluntary Quality Rated, early education and school‐age care programs embark on a path of continuous quality improvement. More and more children in the United States and in Georgia are cared for every day in out-of-home early care and education settings. Research supports that the quality of care children receive in their child care settings dramatically affects their physical, mental, and academic development. Consequently, the emphasis on improving the quality of early care and education services has increased. Increase quality of early care and education services. Increase families’ understanding and demand for higher quality early care and education. Increase professional development opportunities, benchmarks, and rewards for a range of early care and education practitioners and providers. Create a cross‐sector framework that can link standards, technical assistance, monitoring, finance, and consumer engagement for programs in a range of settings, including family day care homes, child care centers, school‐based programs, Head Start programs, and others.